Include Songbirds Music at your next party! Adults and children alike will enjoy your child’s next birthday party with interactive musical entertainment! Songbirds Music provides entertainment for children’s birthday parties, holiday parties, and special events. Songbirds Music cannot accommodate large parties with more than 18 participating children. 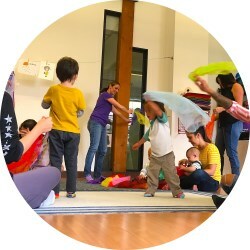 All children and attending parents are included in songs, movement, and instrument play activites ranging from 30 to 45 minutes in length, depending upon the interest and attention of the guests. Music provided at the event may include, but is not limited to, the Music Together® and Canta y Baila Conmigo® curriculum. Parent participation is required. Efforts will be made to accommodate special song requests made up to five days before the event. To book Songbirds Music at your child’s next party call our office at 858.638.7232 or email director@songbirdsmusic.com.